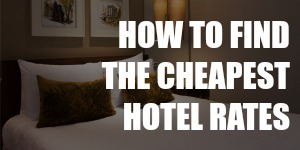 It’s usually best to use credit cards when you travel. For one, credit cards are safe because they come with fraud prevention features. There’s no danger of someone draining your bank account. But if you think there’s a catch, you’d be right. There are two catches, actually: foreign transaction fees and dynamic currency conversion fees. But you can avoid paying these fees. For a regular transaction abroad, most credit cards charge a foreign transaction fee of 3% — 1% goes to the transaction network (MasterCard, Visa, etc.) and 2% to your bank. It doesn’t seem like much, but 3% of every transaction adds up. You could be hemorrhaging money! If you spend just $1,000, you’d be paying $30 in foreign transaction fee. That’s one night in a hostel or a nice dinner out. And if you’re on an extended round-the-world trip or traveling indefinitely, you could easily pay hundreds of dollars in foreign transaction fees per year. On a conventional budget of $20,000 a year, you’d pay $600 to your bank. That money could cover a few nights of pampering yourself at a nice hotel or even a whole month of expenses in some places! Why would you want to give your bank all that money when you don’t have to? 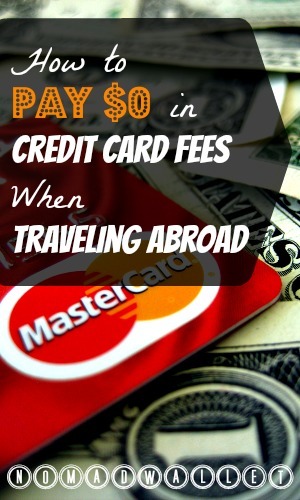 Some credit cards don’t ever charge you foreign transaction fees. 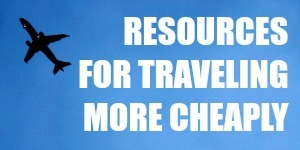 It may take some time for you to find and get the best credit cards for travel abroad. But once you get one of these cards, you’d be on your way to great savings. Americans are spoilt for choice, but many travelers prefer Capital One — it doesn’t charge foreign transaction fees. Brits also have many choices, but I’ve heard especially good things about the Halifax Clarity MasterCard — it doesn’t charge foreign transaction fees or cash advance fees. Canadians don’t have as many options, but at least there are some Chase credit cards that waive the foreign transaction fee. Check out the Chase Marriott Rewards Premier Visa card and the Chase Amazon.ca Rewards Visa card. New Zealanders, sadly, don’t have any credit card without foreign transaction fees. Your best bet is a prepaid card, the Air New Zealand OneSmart MasterCard. You can read more about it on this blog post by a savvy Kiwi. When you pay for a transaction abroad, the default is to pay in the local currency of the country where you are. For example, if you pay for dinner in Thailand with your American credit card, you would pay the merchant in Thai bahts. Your bank would then convert the currency for you in the credit card statement. Sometimes, the merchant offers you the option of making the payment in your home currency — a service known as dynamic currency conversion (DCC). Using the same Thai dinner example as above, you would pay the merchant in U.S. dollars. Now, the merchant is the one who converts the currency for you, usually at a worse exchange rate. Additionally, you’d end up with a DCC fee of between 3% and 7% for the “convenience” of paying in your home currency. Always pay in the local currency of the country where you are. 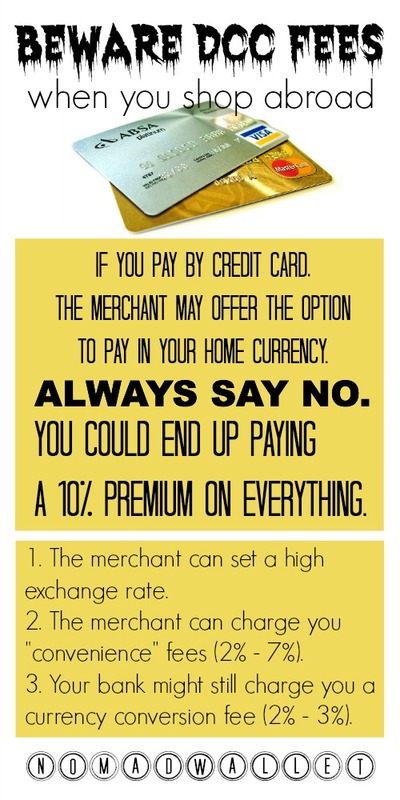 This could be easier said than done because some merchants would go to great lengths to make you pay in your home currency. After all, this is quite a profitable scheme for them. Use an American Express credit card. AmEx forbids their merchants from charging currency conversion fees on their cards. Images: 1. 401(K) 2012 (CC BY-SA 2.0 License); 2. LotusHead (CC BY-SA 3.0 License). The Travel Quiz: What’s Your Travel Personality? Great tips! are there any South Afican banks that don’t charge you international ATM fees? Luke, sorry I don’t have that information. Hope you manage to find a solution. Great tips! Are there any Canadian banks that doesn’t charge international ATM fees? Hi Charmaine, glad you like the read! 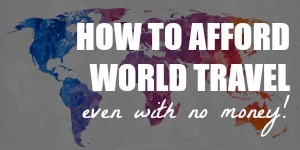 Check out this other post for the details on ATM fees: How to Avoid Foreign ATM Fees When You Travel Abroad. Thank you, this was very helpful. As a Canadian, I picked up the no-fee Amazon.ca Visa with no foreign currency conversion fee for all my travel. Awesome. a thought for Canadians… I use a US$ BMO credit card and buy US cash at home when the rate is good. The exchange rate for foreign currencies into US$ is better than foreign to CAD$. Good idea! There are a few Canadian banks that issue US credit cards, I have a US RBC credit card myself. For Americans traveling internationally, Capital One is still the best option by far so you don’t have to research any further. Their credit card is one of the few that has always had a 0% foreign currency conversion fee (long time happy customer) and so does their ATM debit card for withdrawing cash abroad. With their acquisition of INGDirect in the USA, they now have two banks where you can open up an account. Capital One bank is their branch bank and CapitalOne360 is for online only banking. The latter offers a decent interest rate as well for checking and savings accounts as well with no monthly fees. Important Tip: Capital One has an online “Vacation Notification” form you should complete to tell the bank that you will be traveling and to which countries. That can help prevent your card from being temporarily blocked if they detect suspicious transactions which requires you to call in to verify (never a fun thing to do on vacation). Good point on the employee possibly not fully understanding how DCC works. There’s no need to blame anyone if all he does is offer the service, but sometimes the employee could be quite pushy. In my other post, which is entirely dedicated to DCC fees, I mention that travelers should first calmly refuse DCC, then ask to speak to the manager if necessary, and report the business to Visa / Mastercard as a last resort. Yes I agree that front desk staff can be quite pushy at times. However more often than not the person who asks (from my experience) seems clueless about the pros and cons (all cons) of the “guaranteed” (but never guaranteed to save money) currency conversion option. One final note. Twice with Hertz when renting a car and declining the currency conversion and asking to be billed in Euros in Europe, their credit card system still converted it to US dollars at great cost to me. Only until I received the credit card bill and did a calculation with the real rate did I realize what they did. Both times Hertz was clueless about it when I called to complain. I was forced to dispute the extra cost with Capital One who were happy to refund the difference. Thanks for the post! I’ve fallen for the home currency one! On my last trip to Europe, I used the United Explorer Card, which has no foreign transaction fees plus I get United miles. Overall, I was very satisfied. Good luck having your Discover card accepted outside the US. It’s not very common, especially in off the beaten path situations! Also, Capital One is notorious for poor customer service and a bad rewards program. I wouldn’t recommend either of them. When I travel, it’s Chase Sapphire Preferred for all my credit card transactions and cash out of my Schwab checking account. Thanks for the pointers, Spencer! I’m not American and haven’t personally used U.S. credit cards, so I get my information from actual credit card holders like you. I use my Charles Schwab check card when I’m out of the country. There is no foreign transaction fee or ATM fees worldwide. They automatically rebate any ATM fees back to your account each month. I don’t know of any other card that does this. That’s a great option for an ATM card. It’s quite popular with American travelers. I like the Chase card for Canadians because.. well, we really don’t have that many choices and it’s nice to be able to go across the border and not be dinged. Depending on the credit card that you use, the fee can be pretty hefty. Why spend money just to spend money, right? Totally agreed. Beggars can’t be choosers, right? ;) The Chase cards aren’t half bad, though! Unfortunately, the 28 degrees one in Australia is no longer fee free!! From the 1st of January, they started charging international cash withdrawals fees. We were so devastated, we have relied on that card for years! Another thing you need to watch is that a bank/credit union can say they charge no fees but then they give a very crappy exchange rate. Unfortunately, the only way to learn about this can be once you are overseas and if you are using multiple cards. I have a credit union card that says it charges no fees, but the rates were always far worse than the 28 degree one despite the fact that they were both mastercards. I would be better off using one that charged transparent fees. I just quickly checked their website. They still don’t charge foreign transaction fees or currency conversion fees on purchases, though, so it seems you’re safe as long as you don’t use it to withdraw cash. Cash advance on credit cards usually immediately incur interest rates anyway, so maybe you could use a debit card instead for cash withdrawals? With a Westpac ATM card, you won’t have to pay ATM fees if you use it at ATM machines of other members of the Global ATM Alliance. Ha, we definitely don’t need to help them make their profits. Thanks Deia!! :-) You just saved me money! I am travelling to the Philippines with my sister in a couple of weeks so this will definitely come in super handy. I was already going to put most of our charges on our AMEX Blue Sky – you just made it super brainless for me! Awesome! That would be great if you want to avoid DCC easily. I did a quick Google search, though, and some sites say that the AMEX Blue Sky charges a foreign transaction fee of 2.7%. You might want to check with your bank. Excellent advice! I echo you on the DCCs….EVIL! And nice worldwide credit card recommendations for avoiding foreign transaction fees; I wasn’t aware of the Chase card as a fee-fearing Canadian myself.